Different types of columns are utilized in various segments of structures. Column belongs to a vertical structural member that generally bears loads in compression. It transmits loads from a ceiling, floor slab, roof slab, or from a beam, to a floor or foundations. Usually, the columns also bear bending moments regarding one or both of the cross-section axes. Given below, the details of various types of columns in building construction. 1. Tied Column: This type of column is generally made of reinforced concrete. Longitudinal reinforcement is detained inside narrowly placed tie reinforcement. It is assumed that 95% of all columns in buildings are attached. 2. Spiral Column: Spiral column is also made of reinforced concrete. Under this type of column, longitudinal bars are detained inside narrowly placed and constantly wound spiral reinforcement. Spiral reinforcement provides lateral restrains (Poisson’s effect) and delays axial load failure (ductile). 3. Composite column: If the longitudinal reinforcement is available in the form of structural steel section or pipe with or without longitudinal bars, it is known as a composite column. This type of column contains extreme strength together with moderately small cross section, as well as exposes strong fire performance. 4. Axially Loaded Column: If vertical axial loads operate on the center of gravity of the cross-section of the column, then it is defined as axially loaded column. Axially loaded column is seldom found in construction as synchronizing vertical loads on the center of gravity of column cross section is not possible.. Instance of this type of column is interior column of multi-storey buildings with symmetrical loads from floor slabs from all sides. 5. Column with Uniaxial Eccentric Loading: If vertical loads are not synchronized with center of gravity of column cross section, but relatively operate eccentrically either on X or Y axis of the column cross section, then it is defined as uniaxially eccentric loading column. 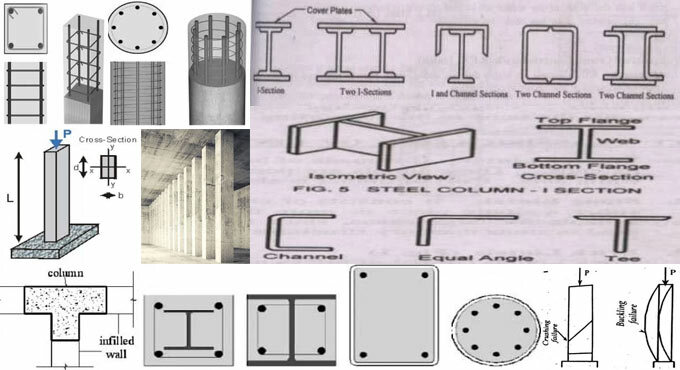 Column with uniaxial loading are usually found in the case of columns firmly connected with beam from one side only like edge columns. 6. Column with Biaxial Eccentric Loading: When vertical on the column is not synchronized with center of gravity of column cross section and does not operate on either axis (X and Y axis), then the column is defined as biaxially eccentric loaded column. Columns with biaxial loading is mostly found in corner columns having beams firmly attached at right angles at the top of columns.